This may be a surprise, but Belgium has some of the best restaurants in the world and falls just behind London and Paris for its count of Michelin stars. The Belgians know how to eat well, and as the country is divided into two parts, Flemish and French, the healthy rivalry between the two different cuisines is all good for the consumer in terms of choice and quality. You will find many of these dishes in northern France which has much in common with Belgium and Flanders. Anguilles au vert or Paling in ‘t groen might be a bit of a turn-off at first. More a Belgian than a French invention, the eels originally came from the river Scheldt in Antwerp. The firm flesh was cut up and then cooked in fish stock or water. Then, herbs that the fishermen found growing along the river bank were added: most commonly sorrel and chervil, but also parsley, mint, and watercress, all of which give the dish its distinctive bright green color. The dish is cooked everywhere, but especially in restaurants in cities like Antwerp and Bruges. Or, take a trip out of Bruges into the flat Polder country and try the Siphon Restaurant in Damme which specializes in the delicacy. 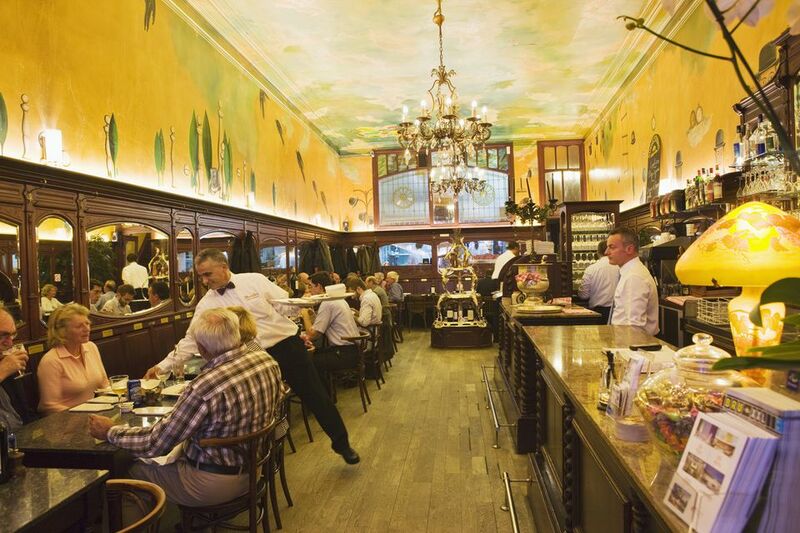 In Brussels try the Belle Epoque brasserie, La Roue d’Or, just off the Grand Place for a satisfying and classic eel dish. The well-known and hearty winter dish of carbonade Flamande or Vlaamse stoverij/stoofvlees was, according to the Belgians, invented by them. The French of course claim that the French equivalent of boeuf Bourguignon was the original. Originally a farmer’s dish from north Europe, ideal for keeping the cold at bay, it’s a rich deeply satisfying plate of caramelized onions and slow-cooked beef. The French use red wine, but in Belgium, the dish is cooked using Belgian beer, particularly Oud Bruin (Old Brown, or Flanders Brown). The beer's secondary fermentation adds a slightly sour flavor and perfectly counteracts the sweetness of the onions. Bread covered in mustard is added and the dish is served with mashed potatoes or ​frites. Nearly every Belgian restaurant will have this on their menu, and it’s particularly popular in traditional brasseries. In Brussels go for Le Fin de Siècle at 9 rue des Chartreux where the old wooden floors, tables, and chairs take you back to 19th-century living. Waterzooï sometimes appears on menus as Gentse Waterzooï, reflecting its origins—it was apparently the favorite dish of the Holy Roman Emperor Charles V who came from Ghent and was partial to the dish. So it stands to reason that Waterzooi was originally made using fish caught in the rivers around Ghent but when pollution killed off that supply, saltwater fish were used instead. Today, it’s as likely to be made with chicken as with fish, cooked with vegetables, herbs, and cream. Not surprisingly, Ghent is a good place for restaurants serving the dish. In Brussels book at the charming In ‘t Spinnekopke which is about as traditional as you can get. You can buy potjesvlees in most food shops so you might try doing that before ordering from a menu. The terrine is traditionally made of three different types of meat: chicken, veal, and rabbit. But the thing that most foreigners find difficult is the texture; the terrine sits in a bed of gelatin and is both sweet and sour, a combination that is not to everybody’s taste. But the Belgians love it; potjesvlees has been made since the 14th century, originating in the Westhoek district of West Flanders, so the area around Ypres and Poperinge is the place to make for—it’s recognized by the EU as a product worthy of special protection there. Most countries have their own version of stoemp, a universally popular and hearty dish of mashed potatoes blended with whatever vegetable there is to hand: onions, carrots, brussels sprouts or cabbage. It’s usually served as a side dish and goes very well with sausages or boudin blanc. In England it’s called bubble and squeak; in Ireland colcannon and champ; hash in the US; pyttipanna in Sweden (available at all good IKEA stores), and in Scotland it goes by the delightful name of rumbledethumps. Belgium claims to be the inventor of moules frites/mosselen-friet, not France. Wherever this wonderful dish originated, you must try it in Belgium where the fries (see below) really are the best in the world. Steaming mussels come in a huge pot, so take an empty shell and use it to get at the delicious meat, then chuck the shell into the second pot — always conveniently provided — and keep going. Take the spoon for the remaining juice at the bottom of the pot. Chez Leon might be right in the heart of Brussels, surrounded by restaurants that mainly cater to tourists, but this cheerful, top-value restaurant is the place to visit for mussels and chips served by unfailingly cheerful waiters. Yes, the Belgians invented frites as well… you will get the best fries in the world in Belgium. They choose the right variety of potatoes and fry them twice to get that crisp outside and soft interior. They're served in almost every single restaurant, but you’ll find the best in friteries (frietkot/frituur), small cafe-size places that offer takeaway and often the odd table or two for a perfect pit stop. In Brussels, make for Maison Antoine at 1 Place Jourdan. In Antwerp, you’ll get fries inspired by Michelin-starred Dutch chef, Sergio Herman, at Frites Atelier at 32 Korte Gasthuisstraat. They come with beef stew, curries and more, or just sauces dispensed from earthenware jars. These tiny, juicy crevettes grises, affectionately if not quite accurately called the ‘caviar of the North Sea’, are particularly popular throughout Belgium. In the past, they were found along the coast by fishermen on horseback. You’ll get them in many restaurants, particularly at the seafood specialists in Sainte-Catherine, once the harbor of Brussels where the quays echoed to the sounds of the fishing boats being unloaded and the daily catch was sold. Try Le Vismet, a chic restaurant where the chef turns the grey shrimps into deep-fried croquettes. The bars and restaurants in the port towns along the North Sea will all serve them, sometimes as a starter, or just to accompany an aperitif in much the same way that olives appear in Provence. You might think that a waffle is a waffle, but there is a difference between the gauffres produced in Belgium and those from, say, the U.S.A. Belgian waffles have large, deep square pockets and are thicker than regular waffles. They first appeared in 1958 at the Brussels World Fair Expo and rapidly spread in popularity across the world. In Belgium, there are two kinds. The Brussels waffle is rectangular, light and flaky; you can take it sweet or savory topping combinations, but most people top their waffles up with whipped cream, chocolate or ice cream (waffle purists insist on just one topping). The Liège waffle contains crystallized sugar and is sweeter—you may find this variety served at breakfast at your hotel. If you want to savor the best in Brussels, go to the Maison Dandoy Tearoom at 31 rue du Beurre. Speculoos, or spiced, shortcrust biscuits, are found everywhere in Belgium. While your first encounter is probably when you order a coffee, you’ll find that these little extras, though delicious, are nothing like the specialized ones that you will find at places like Maison Dandoy. Here they are made in traditional fashion with genuine butter and brown sugar and baked in special wooden molds with pretty designs.